Margaret Jenkins’ work “Time Bones” is a work-in-progress and also a compilation of material from 75 of her former works. For this piece, to be premiered in 2013, Jenkins has chosen seven numbers, created by different composers, danced by her current eight-member company. 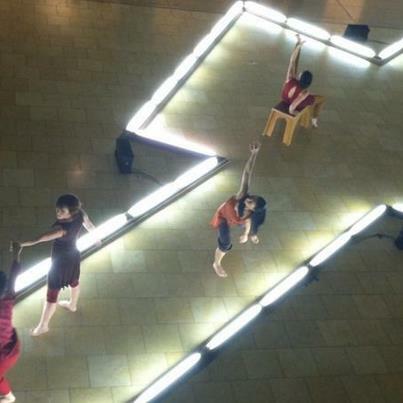 A special tribute was made to dancer/collaborator Heidi Schweiker, who gave her final performances with this event. The opening was set in the JCCSF Atrium in a path of light. Three dancers entered, reminiscent of a Greek chorus. They were followed by Risa Larsen and Chad Dawson, who together performed a quiet, haunting duet. When the audience moved inside the theater, the dancers used risers in the pit before the stage, crawling, rolling, and lifting one another before entering the stage itself. A remarkable screen by visual design artist Alexander V. Nichols enclosed the stage itself, opening eventually to disclose the dancers within. What followed was a series of excerpts, the “bones” (as Jenkins writes) of past work. All sections are fascinating. Some include gestural material; others focus on locomotion, lifts, extended floor work and interrelationships. All are brilliantly danced. The viewer not familiar with this work might ask, “Where is the dramatic continuity?”— especially when gesture and relationships are established and then abandoned. Jenkins’ music collaborators include Jay Cloidt, Alvin Curran, Paul Dresher, Rinde Eckert and Kevin Volans. Text, as in the past, is provided by Michael Palmer. Costume design is by David Draper, sound design by Gregory T. Kuhn. The dancers are Margaret Cromwell, Chad Dawson, Kelly Del Rosario, Steffany Ferroni, Chinchin Hsu, Risa Larsen, Heidi Schweiker and Ryan T. Smith. It will be intriguing to see “Time Bones” in future performances.